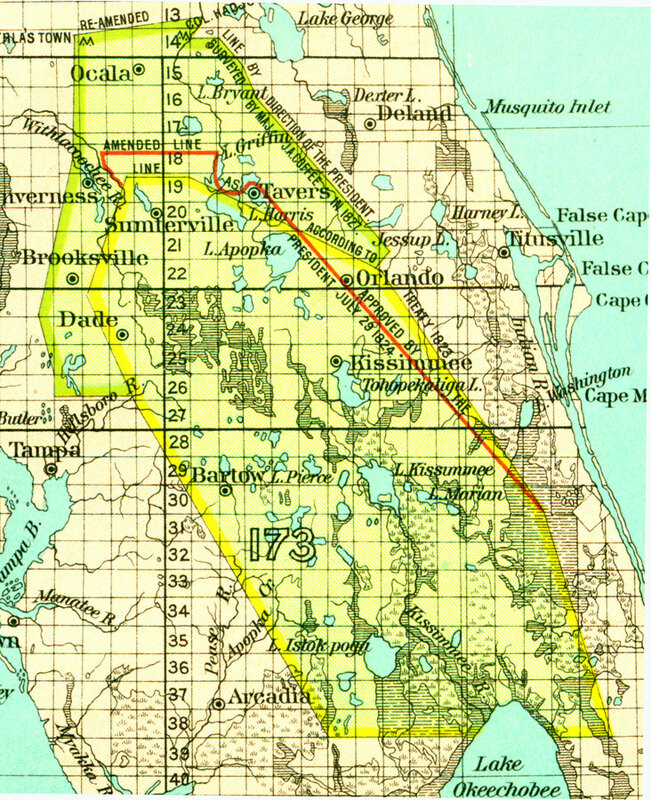 Description: A map of the primary pre 1832 Native American reserve in Florida showing original treaty lines and amended reserve lines in the large peninsular reservation. The map also shows wetlands and swamp areas, major cities, and the Township/Range grid originating on the Tallahassee Base Line and Tallahassee Meridian. Map scale is 50 miles to 1 inch. The peninsular reserve is described in text as: "The boundaries of this reserve were partly surveyed and the remainder approximated by Colonel Gadsden in 1824. They are shown by yellow lines. Colonel Gadsden recommended an addition to the reserve to include more tillable land. This addition was made by Executive order, July 29, 1824, and is shown by a crimson line. A second addition was made for a like purpose by the President, and Maj. J. A. Coffee surveyed the same in 1826. This second enlargement is shown by green lines. The reserve as thus enlarged was ceded to the U.S., May 9, 1832." — Bureau of American Ethnology, Eighteenth Annual Report.